10% off is pretty great, but it gets even better since Discover is running an overlapping promo whereby all the cashback new cardholders earn in your first year of membership is doubled at the end of the year. Since the card earns 1% back on all purchases that's a total of 11% back that will be doubled to an impressive 22%. The way they're excluding gift cards kind of stinks. But 22% off on groceries including wine is pretty sweet. If you're an existing Discover cardholder, it's worth calling to see if they will sign you up for the double cashback offer. I did when the offer came and they enrolled me in the double cashback offer. So with 22% in mind, I made my way to a nearby Whole Foods that sells wine. Not all do. See: Which grocery stores in MA sell wine? The last time I was at this store they had Alto Moncayo Veraton (read more...) for a fair price. With their typical 10% off 6 bottles (or whatever it is) plus 22% off, I thought I could get a pretty good deal. Unfortunately, they were out of the Veraton. So I poked around looking for some 2012 Oregon Pinot Noir because it's such a great vintage and I love Oregon Pinot Noir in the fall. 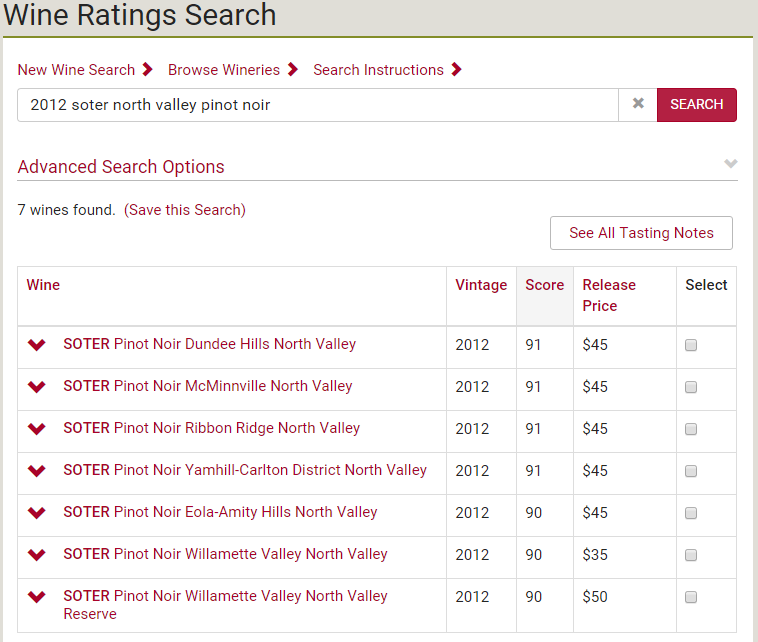 I happened upon some Soter North Valley Pinot with a shelf-talker touting a 92 point Wine Spectator rating. They seemed to have quite a few of these signs in place mentioning Wine Spectator scores. I don't remember seeing them before. It was a little strange through because there were bottles of both the 2012 and the 2013 Soter North Valley Pinot Noir on the shelf. Which one got the 92 point rating from Spectator? I busted out my phone and looked. Turns out neither vintage got a 92 point rating from Spectator. 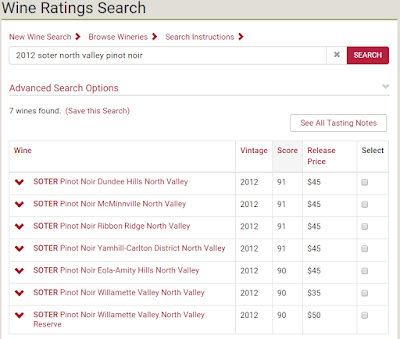 The 2012 Soter North Valley got a 90 point rating. And none of the Soter 2013s have been rated yet. And it wasn't a matter of the rating being from the 2011 vintage. That wine was rated 84 points by Spectator. Seems like they just made the rating up. Or mistook one publication for another? I honestly don't know. 2 Points? What's the big deal? Now, you might say "what's the big deal about a couple points?". Well, in my estimation for every 3 points the difficulty of attaining a score doubles (read more about the WWP QPR theory). So 2 points in the tight band where most wine ratings fall actually is a big deal in terms of quality. I decided to spot-check another nearby wine of interest: The 2012 Benton-Lane Pinot Noir. That shelf talker said Spectator rated it 86 points. Turns out Spectator rated it 88 points! Seems like they're just making up numbers or, I don't know - mistaking Wine Spectator for Wine Enthusiast? I honestly have no idea. I wrote a piece for Palate Press way back when the publication debuted about Shady Shelf Talkers and how it seemed to me that retailers were using them to deceive customers. I honestly don't think that's the case with Whole Foods. It seem they're just sloppily reporting the numbers. It's not the end of the world, but I do have an issue with it. I think if they're going to try to provide customers with ratings from they should at least be accurate. But since, in the 2 cases I spot checked, one rating was higher and one was lower it seems that they're not being shady. They're just being sloppy. Ultimately, I left without buying anything at all and went to a local wine shop and picked up what I thought was a more interesting assortment of wine. All that said, I think Whole Foods is a great place to shop for groceries. And the 22% off is an excellent deal. Just be sure to keep your receipts if you do take advantage of the promo. I hear they're policing the gift cards a little aggressively.